The airline is established on 13th December, 2004 in Bucharest and it is the first Romanian airline with a 100% private capital. It is the first Romanian low-cost airline that offers flights to many European cities at low prices and excellent conditions for its customers. Blu Air acquires its first plane Boeing 737-300 in December, 2004. In August, 2005 Blu Air enlarges its fleet with one more Boeing 737-300. Established in 1995 EasyJet is an airline which transports more passengers than any other British company. Its fast success and growth pave the way for the boom of the cheap airlines during the late 90s, although the company was not the first, either the biggest low-cost transporter in Europe. Germanwings is the biggest German low-cost airline. It relies on the experience and knowledge of its founders Eurowings Luftverkehrs AG and Deutsche Lufthansa AG. Established in 1997 under the name Eurowings Flug and renamed Germanwings in 2002, the airline is growing extremely fast, adding new destinations to its services. It is the first low-cost transporter in Germany which offers transfer connections. RyanAir is an Irish low-cost company with a main base in Dublin, Ireland. RyanAir has one of the best developed network which has flights to more than 160 destinations in Europe and Morocco. In the near feature the company considers opening a low-cost flight to the East cost of the United States. Wizz Air is a low-cost airline, established in 2003 and registered in Hungary and Poland. Typical for the services of Wizz Air is the payment of the specific components, the usage of cheap and unloaded airports, one class of the flights, floating distribution of the seats and catering in the plane which is optional in return for additional payment.The airline uses secondary airports. This way it reduces the airports’ fees and use more rational the planes since the delays are shorter than at the rushed airports. Like us in Facebook or sign up for our great newsletter, if you want to be up to date with the latest promotions and special deals for airline tickets, holidays abroad and in Bulgaria. USIT COLOURS is one of the biggest and most progressive tourist agencies in Bulgaria. 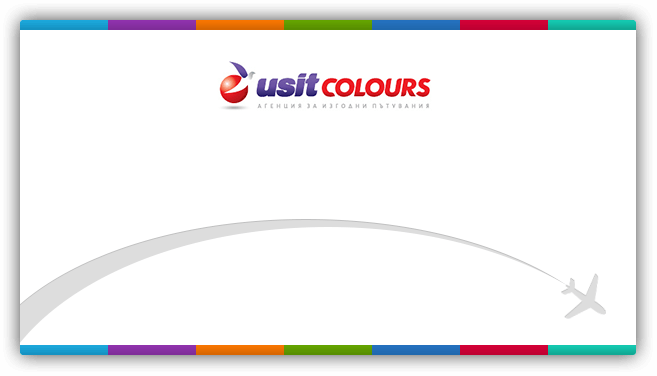 Founded in 1996 as a student travel agency, Usit Colours soon expanded its business and currently provides diverse tourist products and services to fully address the needs of a wide variety of customers – corporate, leisure and students.